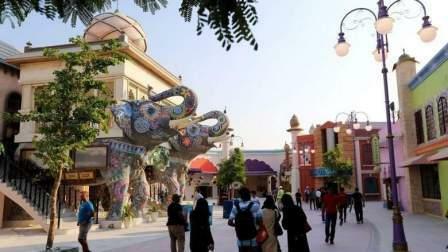 Many residents in the UAE might have already chalked out their plans for Eid Al Ahda holidays. Some of them must have booked tickets to various foreign destinations. But some would prefer to stay in the country spending quality time with their family and friends. There are a lot of places to visit during the long weekend in the UAE and many companies have announced various promotions for the period. Let's take a look at some of such spots and offers. You can witness The Jumeirah Beach Residence (JBR) shoreline lighting up with a gorgeous rainbow of fireworks, fizzers and sparklers for Eid Al Adha, as the largest celebratory display gets underway from August 31 to September 3. For your children, Kid's Play Area will be installed at the South Lawn in front of Pots, Pans, and Boards. Please arrive early and hang around for some extra special performances after the fireworks. Plus, you can also avail discounts at the stores at The Beach. Besides, you have a chance to enjoy 20 per cent discount on the 1-week pass at The Warehouse Gym from August 31 to September 3, 2017. With a serene waterside setting and dramatic skyline views, Festival Bay at Dubai Festival City provides a nice setting for the first day of Eid Al Adha. There's plenty to keep you entertained, including traditional dhow rides, family activities and, of course, stellar shopping at Festival City. Afterwards, you can watch the night sky light up in a blaze of colour and music at the popular waterfront promenade at 9pm and 11pm. Dubai Parks and Resorts, the region's largest theme park destination, has also announced its new season line up. You can see the premiere of the Lionsgate zone at Motiongate Dubai and a series of exciting events on the river at Riverland Dubai. Effective from September 1, 2017, UAE residents will be able to take advantage of the winter season rates of Dh165 for a day ticket to Motiongate Dubai, Legoland Dubai and Legoland Water Park and Dh95 for a day ticket to Bollywood Parks Dubai. You can book your tickets online at www.dubaiparksandresorts.com. Tickets will also be available at the park gates. Don't miss the chance of watching Dubai's first permanent aqua-based show - La Perle - set to open on August 31. Produced by the cultural creation company Dragone, it will be held in the new Al Habtoor City. In a custom built state-of-the-art aqua theatre, you will be able to see 65 world class artists who will perform aqua and aerial feats with the assistance of 70 specialised technicians. La Perle uses 2.7 million litres of water and there are no hydraulic lifts or fountains. It's best to say that the stage can transform from wet to dry in a matter of seconds. You can also expect new attractions that will be designed especially for the final three weeks of Modhesh World, alongside existing offerings in the form of numerous rides, games, workshops, live performances and the all-new food park arena. Modhesh World runs in Hall 1-6 in the Dubai World Trade Centre until September 3, 2017. Tickets are valued at Dh20 and kids under the age of two enter for free. Regular timings: 11am to 11pm from Sunday to Wednesday, and 11am till midnight from Thursday to Saturday. Dubai Properties will enhance the festive ambience at its flagship destinations during this Eid Al Adha at Bay Avenue, Bay Square in Business Bay and JBR - through hosting a range of live events. In addition, Dubai Properties' other communities, including Mudon, Shorooq and Al Khail Gate, will host kids' workshops and fun-filled activities catering to families at their community centres. You can celebrate this memorable time of the year and experience an authentic cultural extravaganza, while also enjoying a varied selection of dining and retail choices. The Al Yallah and Dabke dance group will keep you riveted as they perform various folk dances. Live acts including stilt walkers and hula-hoop groups decked in LED lights, will add to the celebratory mood. You can make your Eid Al Ahda extra special with your family and friends by heading to Yas Island to watch the fireworks. Book a spot as fireworks will be displayed on the first day of Eid at 9pm. Visitors can enjoy their dinners while watching the fireworks at one of the restaurants in Yas Marina. You and your family can enjoy themed cultural activities - including arts and crafts for children - in The Galleria. There is an interactive live art demonstration, with Instagrammable 3D floor art, beautiful Eid décor and traditional calligraphy. Witness a three-day Eid celebration with onstage activities being coordinated by a bilingual MC in this mall. It's an annual event, wherein each day you can see specific dances performed on stage by a group of professional entertainers with ethnically inspired choreography, music and costumes. The event will also host fun games for kids and families.
. Traditional henna design, arts and crafts, face painting, and an interactive corner for kids during Eid, on September 1 and 2, the park will be open from 11am to 10pm. The luxury Al Raha Beach Hotel on Abu Dhabi-Dubai has a great location for holiday seekers and proximity to all Yas Island attractions. The hotel offers wonderful resort leisure facilities for adults and kids. Family and friends looking for a great getaway so close to the city will find Al Raha Beach Hotel the perfect venue to spend the Eid Al Adha holiday with packages starting from AED613 per night which includes a gourmet breakfast for two adults and two children under six years of age. The package lets one sample the rich offerings at the hotel's dining outlets where guests can enjoy 20 per cent off your total bill. The long weekend is also a great excuse to get pampered and get a much-needed massage and beauty treatment before heading back to face the hustle and bustle of city life. Guests availing of the Eid Al Adha package get 20 per cent discount on a variety of treatments at the Body and Soul Recreation Club. Danat Al Ain Resort is an idyllic retreat in the Garden City of Al Ain. During the first and second day of Eid, the resort will be offering a la carte menu for brunch at the poolside. You can take your family there. In Sharjah, you can enjoy the glittering fireworks at Al Qasba. There are also fun activities in store for your little ones.